At the moment I have developed the below code which rotates an input image, padding it with black borders, giving me A. What I want is B - the largest possible area crop window within the rotated image. I call this the axis-aligned boundED box. This is essentially the same as Rotate and crop, however I cannot get the answer on that question to work. Additionally, that answer is apparently only valid for square images. My images are rectangular. 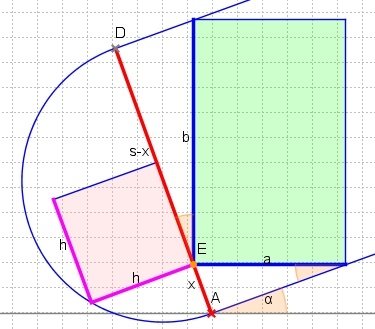 axis-aligned rectangle (maximal area) within the rotated rectangle. we have the condition s ≤ lsin 2α, where s and l are the shorter and longer side of the rotated rectangle. giving x = sin α(lcos α - ssin α)/cos 2α. From a = x/sin α and b = (s-x)/cos α we get the above used formulas. 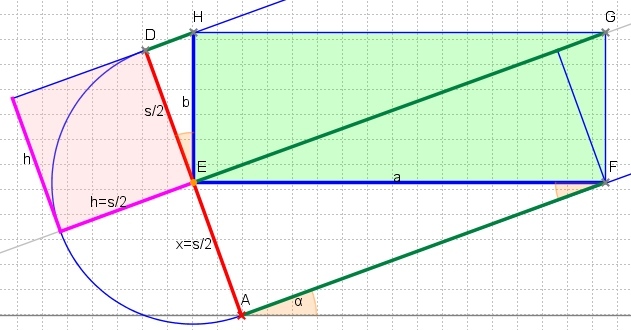 So, after investigating many claimed solutions, I have finally found a method that works; The answer by Andri and Magnus Hoff on Calculate largest rectangle in a rotated rectangle. The below Python code contains the method of interest - largest_rotated_rect - and a short demo. axis-aligned rectangle within the rotated rectangle. print "Press [enter] to begin the demo"
print "Press [q] or Escape to quit"
Simply place this image (cropped to demonstrate that it works with non-square images) in the same directory as the above file, then run it. Congratulations for the great work! 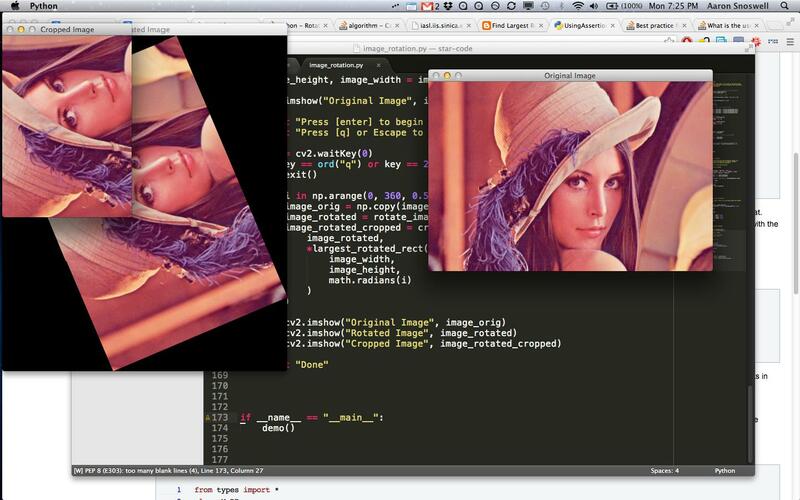 I wanted to use your code in OpenCV with the C++ library, so I did the conversion that follows. Maybe this approach could be helpful to other people. // axis-aligned rectangle within the rotated rectangle. I personally needed this function in TensorFlow and thanks for Aaron Snoswell, I could implement this function. image: A `Tensor` representing an image of arbitrary size. output_height: The height of the image after preprocessing. output_width: The width of the image after preprocessing. rotation_degree: The degree of rotation on the image. do_crop: Do cropping if it is True. If you need further implementation of example and visualization in TensorFlow, you can use this repository. I hope this could be helpful to other people. A small update for brevity that makes use of the excellent imutils library. Correction to the most favored solution above given by Coprox on May 27 2013: when cosa = cosb infinity results in the last two lines. Solve by adding "or cosa equal cosb" in the preceding if selector. Addition: if you do not know the original non-rotated nx and ny but only have the rotated frame (or image) then find the box just containing this (I do this by removing blank = monochrome borders) and first run the program reversely on its size to find nx and ny. If the image was rotated into a too small frame so that it was cut along the sides (into octagonal shape) I first find the x and y extensions to the full containment frame. However, this also does not work for angles around 45 degrees where the result gets square instead of maintaining the non-rotated aspect ratio. For me this routine only works properly up to 30 degrees. Still a great routine! It solved my nagging problem in astronomical image alignment. Inspired by Coprox's amazing work I wrote a function that forms together with Coprox's code a complete solution (so it can be used by copying & pasting with no-brainer). The rotate_max_area function below simply returns a rotated image without black boundary. // axis-aligned rectangle (maximal area) within the rotated rectangle. Not the answer you're looking for? Browse other questions tagged python algorithm opencv aabb or ask your own question. tensorflow: how to rotate an image for data augmentation? How to rotate an image surrounded by black border?